There are currently 14 classrooms. To facilitate the expansion of the school, two additional classrooms were built with the support of a grant from the States of Jersey. All classrooms are bright and attractive with interactive whiteboards and computers. Classroom furniture is of high quality and designed to suit the age of the students. Cloakrooms and toilets are off the main corridors and therefore separate from the classrooms. The school boasts a large hall that is used for assemblies, PE, dance and drama. At the rear of the hall, a new teaching base was recently constructed and is used for instrumental tuition and small group teaching. It also houses the School Uniform Shop, which is run by a group of volunteer parents. The school has recently created a state-of-the art ICT Suite with the latest technology available to students. The room is equipped with 30 new PCs and an interactive whiteboard. A large Art & Craft room is fully equipped to stimulate creative art and design. This room also houses a kiln for clay projects and a cooker for cooking activities. 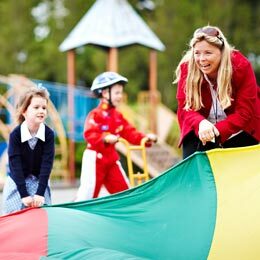 A dedicated Teaching Assistant ensures the room is well maintained, organised and resourced. A large library area is situated between the Art Room and the ICT Suite and books are circulated electronically. Key Stage 2 students enjoy lunch at Grainville School’s cafe, run by Jersey Potteries. Parents may order hot lunches online. Packed lunches may also be consumed in this excellent modern facility. A door in the fence linking the grounds of the two schools has been created to ensure the safety of the students as they move between FCJ and the cafe. The students in Foundation Stage and Key Stage 1 eat lunch in their classrooms, supervised by FCJ staff. A cleaner is also employed to ensure the rooms are cleared and ready for the afternoon session of learning. Two large playgrounds to the rear of the school are equipped with climbing frames suitable for younger and older children. Outdoor seating under electronic awnings provides shade during hot sunny weather. The playgrounds are marked with two netball courts and various outdoor games. There is also a small garden/grassed area for play. A large sports field to the front of the school is used throughout the year for the many sporting activities that are provided by the school. To the left of the sports field are a large sensory garden and a fruit & vegetable allotment. Two large garden sheds house the gardening tools as well as a wide range of outdoor play equipment for use during lunch breaks. 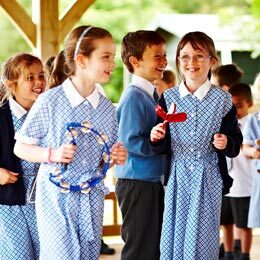 A large outdoor classroom provides space for outdoor teaching and learning as well as shade at break times during hot sunny days.